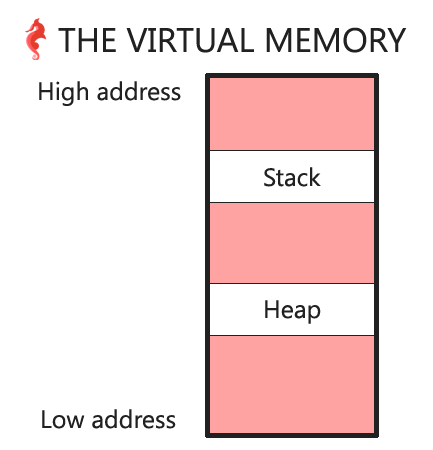 This is the fourth chapter in a series around virtual memory. The goal is to learn some CS basics, but in a different and more practical way. Why doesn’t our allocated memory start at the very beginning of the heap (0x2050010 vs 02050000)? What are those first 16 bytes used for? Is the heap actually growing upwards? malloc is the common function used to dynamically allocate memory. This memory is allocated on the “heap”. Note: malloc is not a system call. 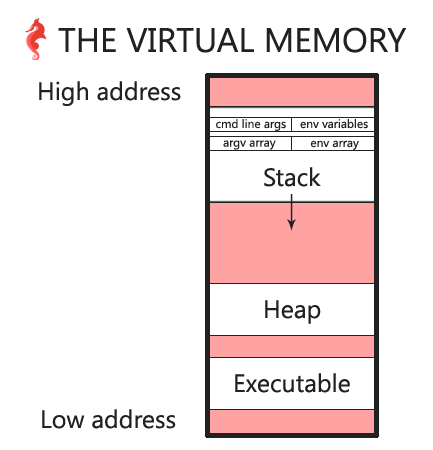 Let’s look at memory regions of a process that does not call malloc (0-main.c). Quick reminder (1/3): the memory regions of a process are listed in the /proc/[pid]/maps file. As a result, we first need to know the PID of the process. That is done using the ps command; the second column of ps aux output will give us the PID of the process. Please read chapter 0 to learn more. Quick reminder (2/3): from the above output, we can see that the PID of the process we want to look at is 3638. As a result, the maps file will be found in the directory /proc/3638. -> As we can see from the above maps file, there’s no [heap] region allocated. -> the [heap] is here. The returned address is inside the heap region. And as we have seen in the previous chapter, the returned address does not start exactly at the beginning of the region; we’ll see why later. malloc is a “regular” function (as opposed to a system call), so it must call some kind of syscall in order to manipulate the heap. Let’s use strace to find out. strace is a program used to trace system calls and signals. Any program will always use a few syscalls before your main function is executed. In order to know which syscalls are used by malloc, we will add a write syscall before and after the call to malloc(3-main.c). ing the break deallocates memory. does not exceed its maximum data size (see setrlimit(2)). 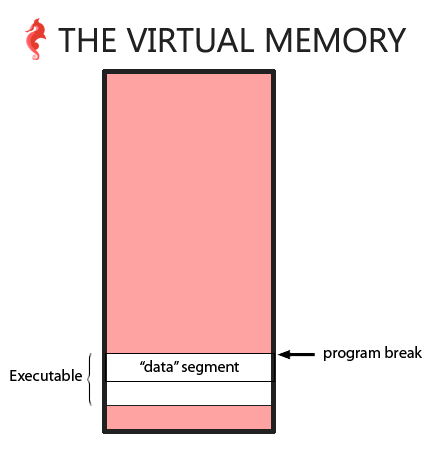 The program break is the address of the first location beyond the current end of the data region of the program in the virual memory. 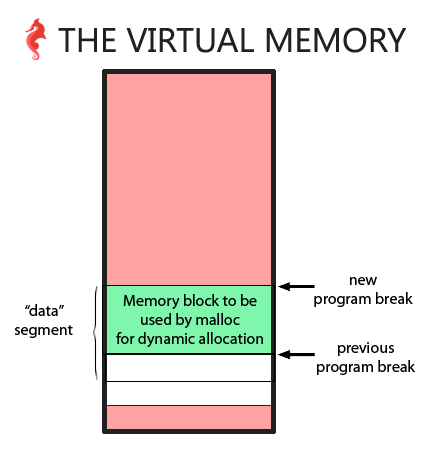 By increasing the value of the program break, via brk or sbrk, the function malloc creates a new space that can then be used by the process to dynamically allocate memory (using malloc). So the heap is actually an extension of the data segment of the program. -> 00e70000-00e91000 rw-p 00000000 00:00 0 [heap] matches the pointers returned back to malloc by brk. That’s great, but wait, why didmalloc increment the heap by 00e91000 – 00e70000 = 0x21000 or 135168 bytes, when we only asked for only 1 byte? -> malloc is NOT calling brk each time we call it. 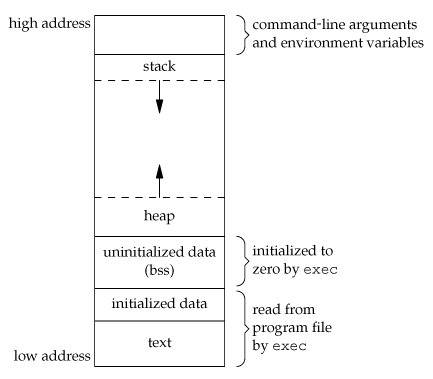 The first time, malloc creates a new space (the heap) for the program (by increasing the program break location). The following times, malloc uses the same space to give our program “new” chunks of memory. Those “new” chunks of memory are part of the memory previously allocated using brk. This way, malloc doesn’t have to use syscalls (brk) every time we call it, and thus it makes malloc – and our programs using malloc – faster. It also allows malloc and free to optimize the usage of the memory. Based on the above, and assuming we won’t ever need to free anything, we can now write our own (naive) version of malloc, that would move the program break each time it is called. If we look at the output of the previous program (4-main.c), we can see that the first memory address returned by malloc doesn’t start at the beginning of the heap, but 0x10 bytes after: 0x1314010 vs 0x1314000. Also, when we call malloc(1024) a second time, the address should be 0x1314010 (the returned value of the first call to malloc) + 1024 (or 0x400 in hexadecimal, since the first call to malloc was asking for 1024 bytes) = 0x1318010. But the return value of the second call to malloc is 0x1314420. We have lost 0x10 bytes again! Same goes for the subsequent calls. There is one clear pattern: the size of the malloc’ed memory chunk is always found in the preceding 0x10 bytes. For instance, the first malloc call is malloc’ing 1024 (0x0400) bytes and we can find 11 04 00 00 00 00 00 00 in the preceding 0x10 bytes. Those last bytes represent the number 0x 00 00 00 00 00 00 04 11 = 0x400 (1024) + 0x10 (the block size preceding those 1024 bytes + 1 (we’ll talk about this “+1” later in this chapter). 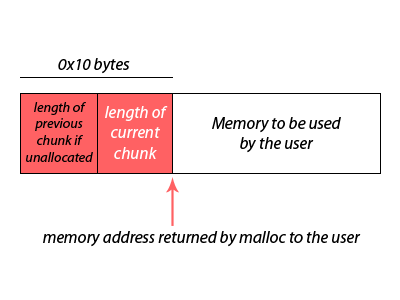 If we look at each 0x10 bytes preceding the addresses returned by malloc, they all contain the size of the chunk of memory asked to malloc + 0x10 + 1. 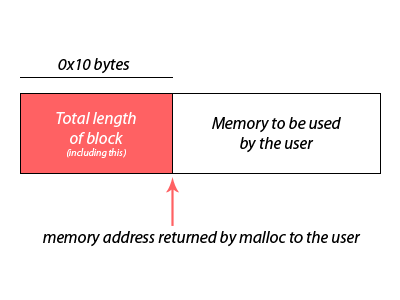 One of our open questions from the previous chapter is now answered: malloc is using 0x10 additional bytes for each malloc’ed memory block to store the size of the block. This data will actually be used by free to save it to a list of available blocks for future calls to malloc. But our study also raises a new question: what are the first 8 bytes of the 16 (0x10 in hexadecimal) bytes used for? It seems to always be zero. Is it just padding? At this stage, we probably want to check the source code of malloc to confirm what we just found (malloc.c from the glibc). 1077                |             User data starts here...                          .
1079                . (malloc_usable_size() bytes)                      . 1089        user. "Nextchunk" is the beginning of the next contiguous chunk. ing memory to the process; decreasing the break deallocates memory. clearly, malloc made only two calls to brk to increase the allocated space on the heap. And the second call is using a higher memory address argument (0x201a000 > 0x1ff9000). The second syscall was triggered when the space on the heap was too small to host all the malloc calls. Let’s double check with /proc. The beginning of the heap is still the same, but the size has increased upwards from 00922000 to 00943000. As a result, the offset between the data section of the executable and the program break initial position when the process runs can have a size of anywhere between 0 and 0x02000000. This randomization is known as Address Space Layout Randomisation (ASLR). ASLR is a computer security technique involved in preventing exploitation of memory corruption vulnerabilities. 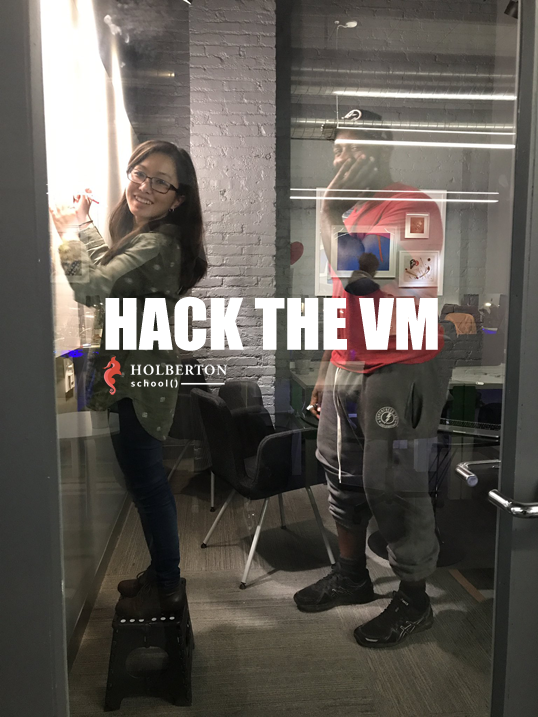 In order to prevent an attacker from jumping to, for example, a particular exploited function in memory, ASLR randomly arranges the address space positions of key data areas of a process, including the positions of the heap and the stack. -> malloc(0) is actually using 32 bytes, including the first 0x10 bytes. Also, studying how free works in coordination with malloc is something we haven’t covered yet. If you want to look at it, you will find part of the answer to why the minimum chunk size is 32 (when we ask malloc for 0 bytes) vs 16 (0x10 in hexadecimal) or 0. As usual, to be continued! Let me know if you have something you would like me to cover in the next chapter. This repo contains the source code (naive_malloc.c, version.c & “X-main.c` files) for programs created in this tutorial. 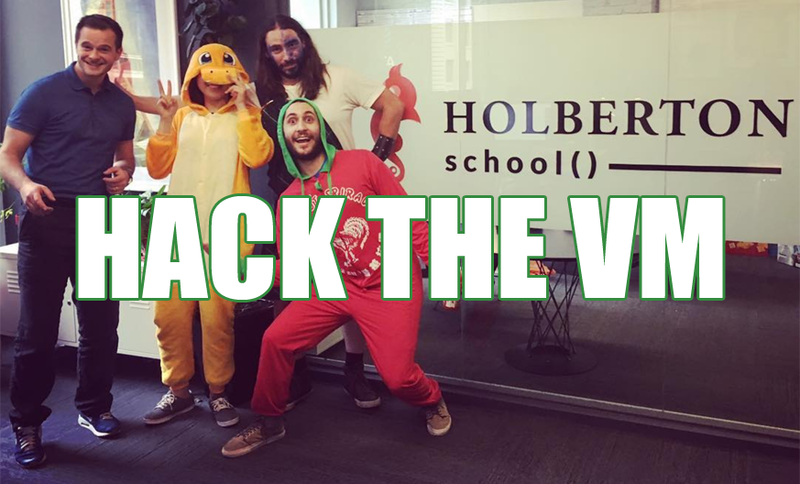 Follow @holbertonschool or @julienbarbier42 on Twitter to get the next chapters! Many thanks to Tim, Anne and Ian for proof-reading!